+ Honor Christ the head – I am so glad that you always keep me in your thoughts, and that you are following the teachings I passed on to you. But there is one thing I want you to know: The head of every man is Christ, the head of woman is man, and the head of Christ is God. A man dishonors his head if he covers his head while praying or prophesying. But a woman dishonors her head if she prays or prophesies without a covering on her head, for this is the same as shaving her head. Yes, if she refuses to wear a head covering, she should cut off all her hair! But since it is shameful for a woman to have her hair cut or her head shaved, she should wear a covering. + Reflect the glory of God – A man should not wear anything on his head when worshiping, for man is made in God’s image and reflects God’s glory. And woman reflects man’s glory. For the first man didn’t come from woman, but the first woman came from man. And man was not made for woman, but woman was made for man. For this reason, and because the angels are watching, a woman should wear a covering on her head to show she is under authority. + Everything comes from God – But among the Lord’s people, women are not independent of men, and men are not independent of women. For although the first woman came from man, every other man was born from a woman, and everything comes from God. Judge for yourselves. Is it right for a woman to pray to God in public without covering her head? Isn’t it obvious that it’s disgraceful for a man to have long hair? And isn’t long hair a woman’s pride and joy? For it has been given to her as a covering. But if anyone wants to argue about this, I simply say that we have no other custom than this, and neither do God’s other churches. + Problems of division – But in the following instructions, I cannot praise you. For it sounds as if more harm than good is done when you meet together. First, I hear that there are divisions among you when you meet as a church, and to some extent I believe it. But, of course, there must be divisions among you so that you who have God’s approval will be recognized! + Problems of gluttony and drunkenness – When you meet together, you are not really interested in the Lord’s Supper. For some of you hurry to eat your own meal without sharing with others. As a result, some go hungry while others get drunk. What? Don’t you have your own homes for eating and drinking? Or do you really want to disgrace God’s church and shame the poor? What am I supposed to say? Do you want me to praise you? Well, I certainly will not praise you for this! + Ordinance of Lord’s Supper– For I pass on to you what I received from the Lord himself. On the night when he was betrayed, the Lord Jesus took some bread and gave thanks to God for it. Then he broke it in pieces and said, “This is my body, which is given for you. Do this in remembrance of me.” In the same way, he took the cup of wine after supper, saying, “This cup is the new covenant between God and his people—an agreement confirmed with my blood. Do this in remembrance of me as often as you drink it.” For every time you eat this bread and drink this cup, you are announcing the Lord’s death until he comes again. + Examine yourself before eating and drinking – So anyone who eats this bread or drinks this cup of the Lord unworthily is guilty of sinning against the body and blood of the Lord. That is why you should examine yourself before eating the bread and drinking the cup. For if you eat the bread or drink the cup without honoring the body of Christ, you are eating and drinking God’s judgment upon yourself. That is why many of you are weak and sick and some have even died. But if we would examine ourselves, we would not be judged by God in this way. Yet when we are judged by the Lord, we are being disciplined so that we will not be condemned along with the world. So, my dear brothers and sisters, when you gather for the Lord’s Supper, wait for each other. If you are really hungry, eat at home so you won’t bring judgment upon yourselves when you meet together. I’ll give you instructions about the other matters after I arrive. 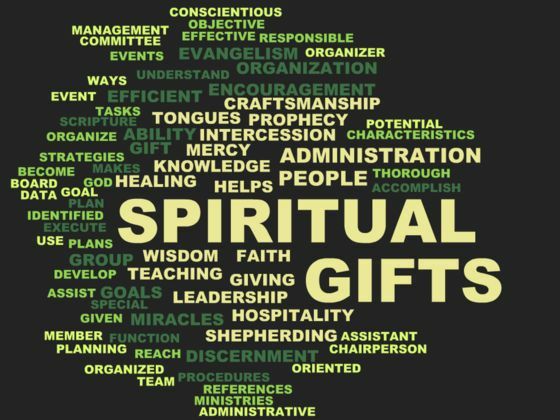 + Different gifts / same Spirit – There are different kinds of spiritual gifts, but the same Spirit is the source of them all. There are different kinds of service, but we serve the same Lord. God works in different ways, but it is the same God who does the work in all of us. + Gifts given for mutual help – A spiritual gift is given to each of us so we can help each other. To one person the Spirit gives the ability to give wise advice; to another the same Spirit gives a message of special knowledge. The same Spirit gives great faith to another, and to someone else the one Spirit gives the gift of healing. He gives one person the power to perform miracles, and another the ability to prophesy. He gives someone else the ability to discern whether a message is from the Spirit of God or from another spirit. Still another person is given the ability to speak in unknown languages, while another is given the ability to interpret what is being said. It is the one and only Spirit who distributes all these gifts. He alone decides which gift each person should have. + We need one another – Yes, the body has many different parts, not just one part. If the foot says, “I am not a part of the body because I am not a hand,” that does not make it any less a part of the body. And if the ear says, “I am not part of the body because I am not an eye,” would that make it any less a part of the body? If the whole body were an eye, how would you hear? Or if your whole body were an ear, how would you smell anything? + We suffer and are honored together – In fact, some parts of the body that seem weakest and least important are actually the most necessary. And the parts we regard as less honorable are those we clothe with the greatest care. So we carefully protect those parts that should not be seen, while the more honorable parts do not require this special care. So God has put the body together such that extra honor and care are given to those parts that have less dignity. This makes for harmony among the members, so that all the members care for each other. If one part suffers, all the parts suffer with it, and if one part is honored, all the parts are glad. Are we all apostles? 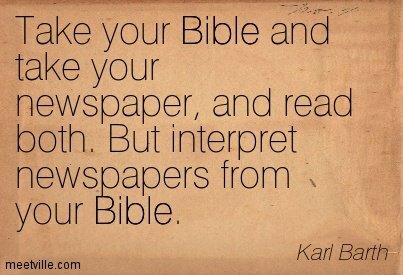 Are we all prophets? Are we all teachers? Do we all have the power to do miracles? Do we all have the gift of healing? Do we all have the ability to speak in unknown languages? Do we all have the ability to interpret unknown languages? Of course not! So you should earnestly desire the most helpful gifts.